Whether you work from an office, home, or a co-work space, web workers tend to spend time both using an external display and the display on a laptop. And so most of us are familiar with the “transition” … all the fiddling that is required to get your workspace setup when you move from one spot to another. A good number of utilities have popped up in recent years to meet some of these needs. The one that stuck for me is Moom. With different sized screens, and now different types of displays (retina and non), moving from an external screen to the laptop display can be an exercise in futility. How many times has that switch left you with an open Finder window on the side of the screen with only 10 pixels showing? Moom, from Many Tricks, is a small menubar application for OS X that is great for controlling the size and placement of your applications on the desktop. It solves a lot of those needs for me. You create window snapshots that are saved in the application. There are two basic types: basic and application specific. The first is simply a determined size and location on the screen and you can use it to take the currently active application and apply these dimensions to its window. The second takes the specified app (or apps) and fits it into the determined location and sets the size. These sounds similar, but they are not quite. The second option will do nothing if the specified application has no windows open. Here's how I use them. 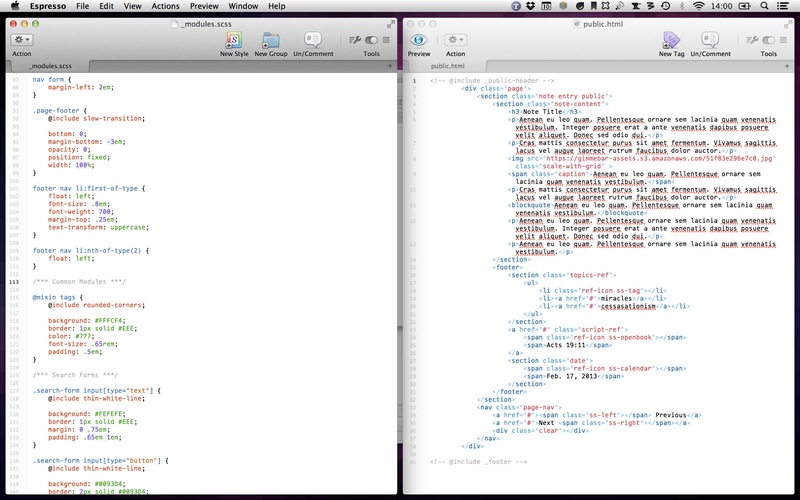 For the first, I often do front end development on my laptop and open the CSS files on the left, the HTML files on the right. Moom comes with a couple of defaults that work well for me, easily allowing me to make each file take up half the screen, one on each side of the screen (if I'm working on the ACD, the browser goes in the middle). Blurred, for your protection. Of course. The second option is great for my work with Campaign Monitor. Doing support for a service like this requires doing a lot of different things each day, but there are several apps that are always running and on screen. 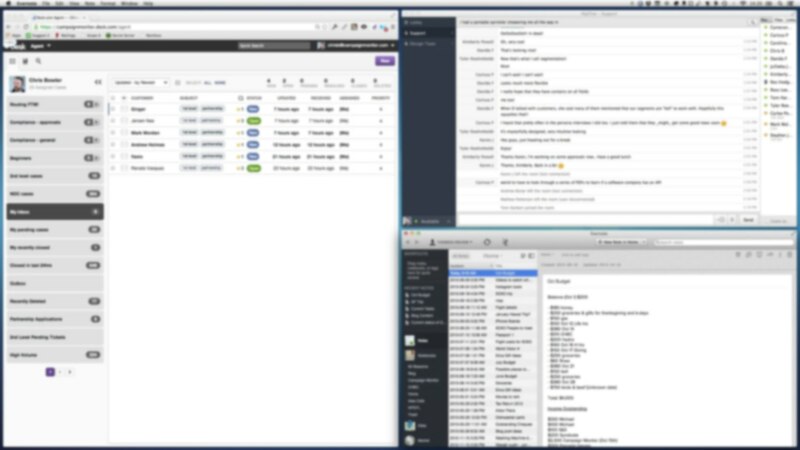 And so I have a Moom snapshot for placing Chrome, HipChat, and Evernote in a specific layout. As well, I have one for the ACD and one for the laptop. There are four methods to trigger a layout to be applied. The first is to use the green traffic light on any OS X window. When Moom is running, hovering the mouse over the green circle at the top left of the window brings up a menu, shown below. This comes with 4 defaults that can be applied. 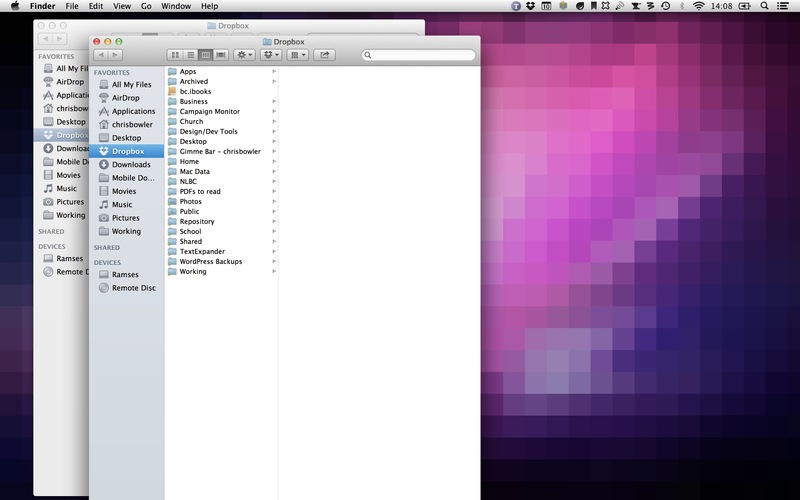 The second method is to use the Moom menubar icon, which then displays all your custom snapshots. Simply click on the one you want applied. And for keyboard lovers, you can create a custom shortcut for any custom snapshot. The last option is to specify an automatic trigger, shown below. You are able to specify the size of the grid you want to use to create your layouts. Then you simply create your custom shortcuts by dragging your mouse over the blocks in the grid that you want the snapshot to apply to (bottom option). It's a clever method of giving the user control. Also note in the screenshot above that you can specify different triggers to have the layout take effect. In this instance, I have it match a particular dimension of screen … meaning it's applied when I move to my desk and connect the ACD. One great example of a problem this solves for me is moving files. 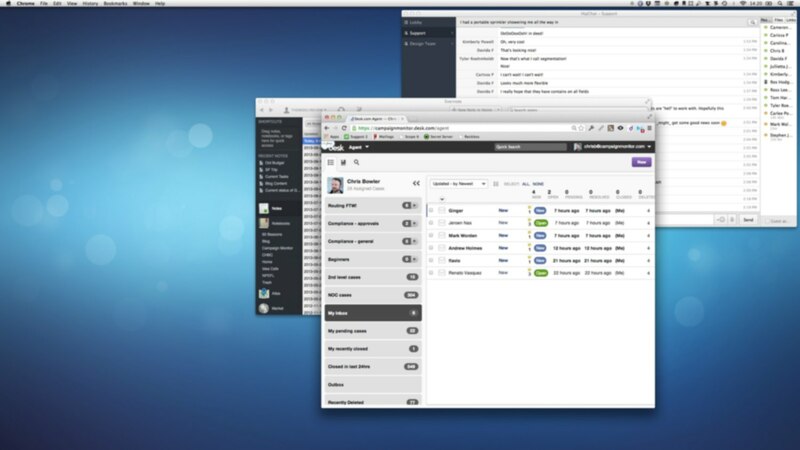 Finder can be a stubborn curmudgeon at times, but Moom can help. 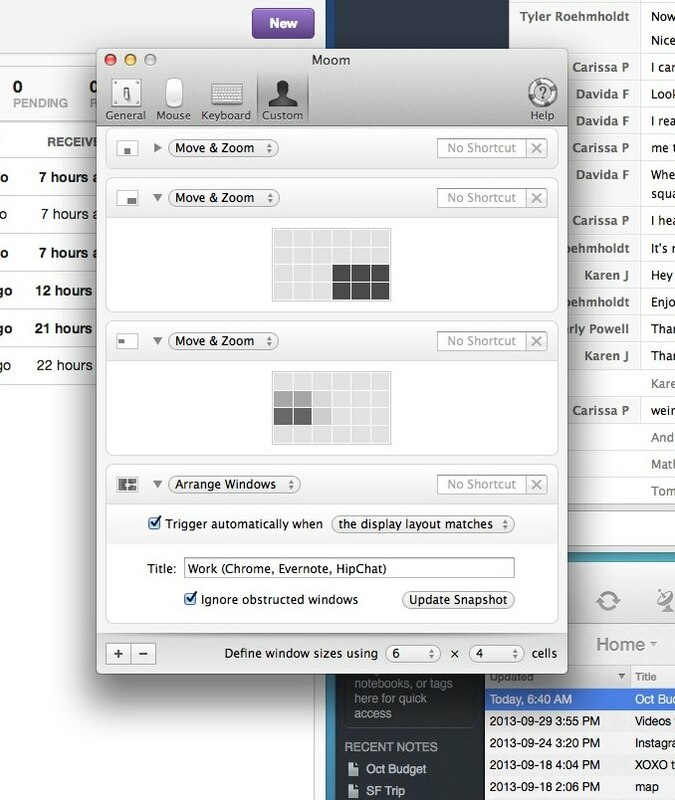 Below is how Finder likes to place the windows when you open two in quick succession. 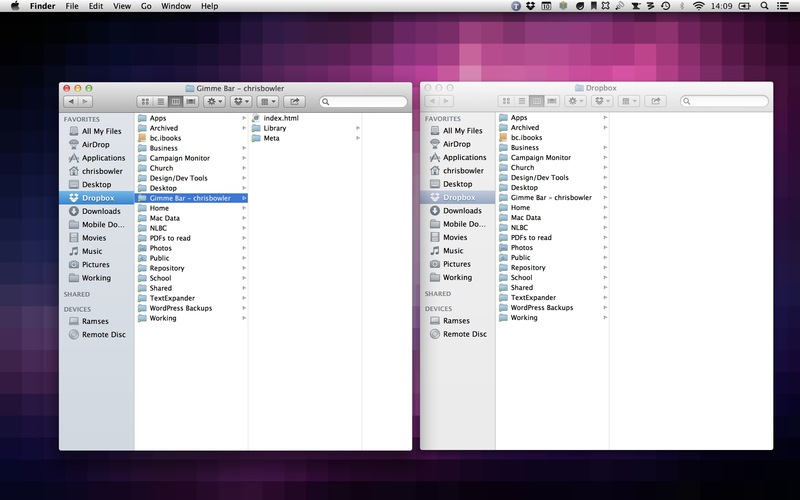 When I need to move files around (and forget that I can easily do that with LaunchBar and the keyboard), I have a Moom snapshot that takes two Finder windows and places them side by side and makes them exactly the same size. For $10, this is a small tool that removes some of the friction of my day. Well worth the price!